At each instant of time Betty, stands on a square of the chessboard, facing one of the four directions (up, down, left, right) when the board is viewed from the above. 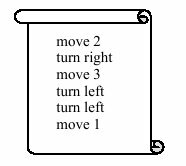 Performing a ``move n " instruction, she moves n squares forward in her current direction. If moving n squares goes outside the board, she stays at the last square on the board and does not go out. There are three types of turns: turn right, turn left, and turn back, which change the direction of Betty. Note that turning does not change the position of Betty.